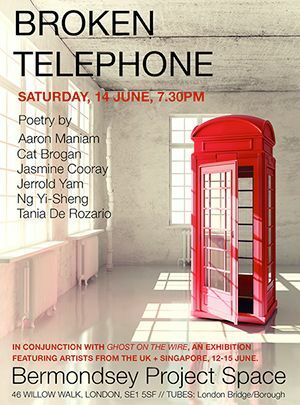 Broken Telephone is a literary reading featuring poetry about (mis)communication, (mis)understanding, (mis)interpretation and human (mis)connections. What can go wrong, will go wrong. Featuring words by writers from UK + Singapore: Aaron Maniam, Catherine Brogan, Jasmine Cooray, Jerrold Yam, Ng Yi-Sheng & Tania De Rozario. This event runs in conjunction with Ghost on the Wire, curated by Gavin Maughfling and Suzanne De Emmony.